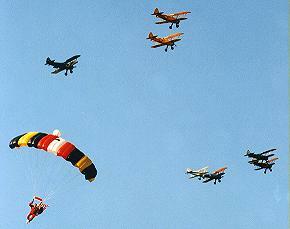 Most skydivers are NOT trained to perform safely at your event. Skydivers are rigorously trained for their own safety, and in the safe operations at airports that normally support skydivers. Demonstration skydives involve a lot more. You are putting the safety of your audience and your own reputation in the hands of your performers. You should know that they are trained for demonstration skydives. The United States Parachuting Association (USPA) recognized this need to train and certify "professional" skydivers. This certification is called the 'Pro' rating, and is the only rating recognized by the Federal Aviation Administration (FAA) for proficiency of a demonstration skydiver. All of our jump team members are seasoned professionals. Minimum experience for our jumpers include over 200 freefall skydives, proficiency skills in both freefall and parachute landing accuracy, and a Master skydiver license issue by the USPA. Our senior jumpers are all Pro rated, while our newer jumpers are coached on the skills required for this rating and perform only under the direct supervision of the Pro rated jumpers. But the jumpers are only half of our demonstration team. Before, during and after our jump, our trained and experienced ground crew will be working with your event coordinator and MC to ensure both the show’s safety and your audience’s enjoyment of our performance. You won’t be left guessing when we will be there, or how the demonstration will unfold. While we also perform independently, my team has been providing professional jump services to the Flying Circus Airshow (FCA) , in Bealeton, VA since 1996.